This chicken, sweet potato, and bacon casserole is comfort food personified. Herbed chicken breasts, sweet potatoes, bacon, sauteed red onion, and Gruyere cheese are mixed together and baked. Weeknights, weekends, dinner for company. It does it all. 1. Preheat the oven to 350°F (180°C) and adjust the oven rack to the middle position. Generously butter a 9-by-13-inch baking dish or shallow 3-quart casserole dish. 2. Pat the chicken dry with paper towels. Either chop the chicken breasts into 1-inch chunks or place each chicken breast on a work surface and, using a sharp knife held parallel with the surface, cut the breast in half horizontally to create 8 chicken pieces. In a small bowl, mix together the thyme, sage, 1 teaspoon salt, and the pepper. Set aside 1 teaspoon herb mixture. Season the chicken on all sides with the remaining herb mixture. 3. Peel the sweet potatoes and cut into 1/4-inch-thick rounds. Stack several rounds on top of each other and cut into 1/4-inch-wide strips. Peel the onion, halve through the root end, and slice into 1/4-inch-wide strips. 4. In a large skillet over medium heat, warm 3 tablespoons oil until hot. Add the chicken and sauté until lightly browned but not cooked through, 2 to 3 minutes per side. Remove the chicken to the prepared baking dish. Add the chicken broth and wine to the skillet and whisk to scrape up any browned bits on the bottom. Cook, stirring, until the liquid has reduced to 1/4 cup, 3 to 4 minutes. Pour over the chicken breasts. 6. In a medium saucepan over medium heat, melt the butter. Add the flour and cook, stirring constantly, for 1 1/2 to 2 minutes. Gradually whisk in the milk and the reserved 1 teaspoon of seasoning. Bring the mixture to a gentle boil, whisking constantly, and cook until it thickens enough to coat the back of a spoon, about 3 minutes from the time the sauce begins to boil. The sauce will be quite thick. Taste the sauce and season with salt if needed. (You can cool, cover, and refrigerate the sauce separately for up to 1 day. Gently reheat over low temperature before proceeding.) Dab the sauce over the ingredients in the casserole and sprinkle with the Gruyère. Cover the casserole loosely with a sheet of foil. 7. Bake the casserole until the chicken is cooked through and tender, 20 to 30 minutes. Remove from the oven and let cool for 5 minutes before bringing it to the table. If desired, garnish the center of the dish with some sage and thyme sprigs before serving. Fall is a favorite time of year at my house, and this chicken, sweet potato, and bacon casserole is worthy of a showing on our autumn table. The instructions are clear, the process simple, and the ingredients delicious and readily available. These are all important to me when I make a casserole. While prepping the ingredients, I decided to chop the chicken into chunks for easier serving. I cooked the bacon first, then sautéed the chicken in the bacon drippings. Sautéing the vegetables went quickly and yielded great-looking sweet potatoes and a lovely aroma. Even before it went in the oven, the casserole looked so delicious I couldn't wait to try it. For this reason, I did not make it ahead, but placed it in the oven as soon as it was ready. During baking, the sauce becomes more like a glaze covering all the ingredients in the dish. I sprinkled some chopped fresh sage on top immediately before serving, which looked beautiful and lent a touch of aroma as it warmed on the surface of the hot casserole. This casserole is addicting. I was hoping to have a little left-over for the next day’s lunch, but no luck. Everyone loved it and it did not survive the evening. Everyone agreed that this chicken, sweet potato, and bacon recipe is a wonderful dish with a great combination of flavors. I love how this recipe uses the same pan instead of messing up a lot of dishes. The author of the recipe did a great job with instructions and timing. A beginner could look at this recipe and follow it with great results, although we felt this was not a casserole. The red onion ended up a dull gray color and did not look appealing but the flavor was great. I would probably change this to a sweet yellow onion next time. We also wished there were a little more sweet potatoes and sauce, because they were delicious. This recipe served 6 servings for us plus enough leftovers to take for lunch the next day. I first made the herb mixture, which is a nice combination of thyme and sage and adds fabulous depth to the finished dish. You also get to practice how to make a white sauce (béchamel). Make sure to melt the butter completely, then whisk in the flour until smooth before adding the milk. Slowly add the milk, whisking all along, to ensure a lump-free sauce. Bring to a boil and whisk until thickened. The herbs really amped up the flavor of the sauce. Slicing the sweet potatoes in rounds, stacking them, then slicing them in 1/4-inch sticks, as well as slicing the onion from root to stem in even 1/4-inch slices, makes for perfectly sliced, visually appealing matchsticks that result in a beautiful presentation in the final dish. To cook the chicken, get the pan hot enough so the chicken doesn't stick to the pan. After heating the pan for a minute or so, I add 1/8 teaspoon water to pan to test it. When the pan is hot enough, the water will glide over the pan like a mercury ball. Slicing the chicken breasts horizontally makes nice thin slices and ensures even and quick browning, which also keeps one from overcooking the chicken, as 2 to 3 minutes is all it took. Pouring in chicken stock and wine not only cleans the skillet, but makes for a very delicious sauce from the fond (or brown bits) left by the chicken. As for putting it all together, the sage, thyme, smoky bacon, creamy spiced béchamel, sweetness of the onions and the sweet potatoes, and the umami from the cheese turned an ordinary chicken dish into something extraordinary. With each bite you'll experience many layers of flavor, which will most certainly delight your guests. The recipe is spot on and I don't think any tweaks or adjustments are needed. This chicken, sweet potato, and bacon casserole is an interesting recipe with its myriad ingredients. Wanting to try something outside the norm, I thought, why not give it a try? The recipe as written is easy to follow and the directions are clear. There are no dominant flavors and everything works well together. However, I found that the cooking times need to be adjusted to the lower temps of home ranges. Allow a little more time to cook bacon and vegetables. Alternatively just bump the temperature up where necessary but be sure to pay attention. I get my bacon at a butcher so its thicker than the supermarket stuff but it took about 15 minutes to become crisp at medium so it didn't burn and it rendered some good fat. I first cooked the bacon cause I wanted to use the grease to cook the chicken. I ended up with 4 tablespoons and used 3 to sear the chicken chicken and saved the rest for the vegetables, which took closer to 20 minutes to soften. The white sauce is straightforward. Once assembled, the casserole was in the oven for the suggested 20 minutes and it was perfect. The combined ingredients work well together and produces a delicious one-pan meal with no need for additional sides. My family thought it was awesome. Don't pass on this one. It's a chicken dish with attitude and I'll be making it again. The Gruyère is not an option; it's what makes this dish. Don't be afraid to add a little more. Bon appetit. It's pretty rare that I come across a recipe with very little that I would want to tweak to make it more to my liking, but this chicken, sweet potato, and bacon casserole is one of those recipes. Of course, what's not to love? Chicken, sweet potatoes, bacon, and an herbed béchamel all sound pretty freaking great on paper. Well, guess what? They're even better on the plate. I made this dish over the weekend when my oldest son, a senior in college, popped in with a few buddies for a visit. I wanted something that would have broad appeal (don't know the tastes of his friends) and that would go down swimmingly with beer (copious amounts were flowing). This dish gave me both in spades. I did modify the technique suggested in the recipe in a few small ways. I chopped and sautéed the bacon first thing, then drained off all but about 1 tablespoon drippings before adding the herb-coated chicken to the skillet, which I cubed rather than cut into a thin cutlet. Infusing the chicken with the flavor of the rendered bacon fat was a huge favor-building change. I also left the casserole in the oven slightly longer than called for because when I pulled the foil from the top at the 20-minute mark, there was still quite a bit of unmelted Gruyère on top. An extra 5 minutes in the oven, uncovered, did the trick. The generous amount of herbs combined with the sweetness of the sweet potatoes and onions, and the salty crunch of the bacon render this dish totally addicting. When I make this again, probably the only things I'll change would be to add a little more sweet potato than called for and to use skinless, boneless chicken thighs, because I prefer them over breasts. Other than that, this is pretty perfect. 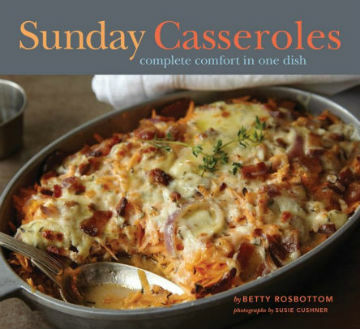 Chicken, Sweet Potato, and Bacon Casserole Recipe © 2014 Betty Rosbottom. Photo © 2014 Susie Cushner. All rights reserved. All recipes and photos used with permission of the publisher.